A quick entry for the 4th OneHourGameJam entry: Survive. Working on a game in an hour is a great way to learn the weaknesses about your development pipeline, be it in coding, art or audio. The result is almost always a project that will get thrown away, seriously it took 60 minutes to make, but the experience is certain to teach you something and sharpen game development skills. 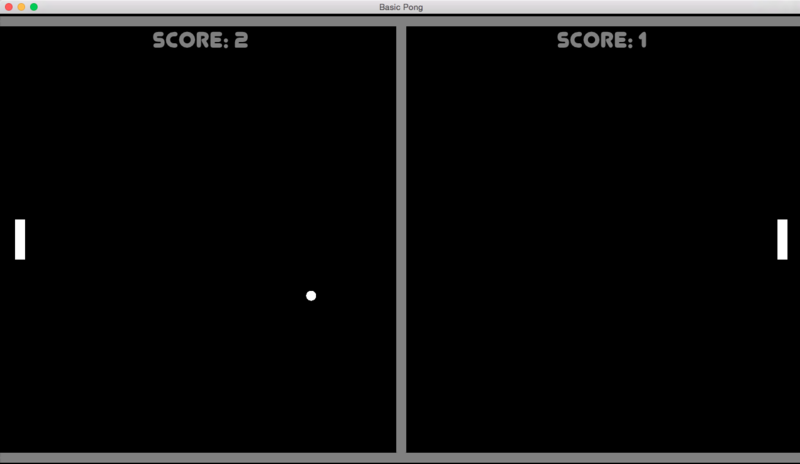 A quick entry for the OneHourGameJam entry: Bouncing Boxes. It has been nearly a month and the ratings are out. I am pretty happy to find out I placed #210 of 1365 compo entries in the category of FUN, arguably the most important category for a game. That is very close to the top 15%, and although I’d be happier in the top 10% after my failure during LD30 I am certainly stoked. There were many ups and downs during the development of Precise Shot, and some time that could have been utilized more efficiently. When the theme, Entire Game on One Screen, was first announced I had a minor moment of negativity since this is a technical limitation. Quickly I started brainstorming ideas and had 3 or 5 games that fit the technical limitation. Playing with the word screen, my runner up idea was controlling an ant/bug in a puzzle environment on a screen door. I decided to sleep on the idea since none of them were really pulling too strongly. After sleeping for 8 hours 18 minutes 58 seconds it became time to eat, while multitasking with a bit of design, before deciding to start working on an arrow shooting game that was becoming quite exciting. It was 10 hours 40 minutes since the compo had begun and Inkscape opened for the first time to create a very basic bow shape. Five minutes later the precreated (splash logo / blackscreen) project was opened up in FlashDevelop and the bow was added. Over the next two hours art for the basic arrow and target were created, aiming and firing the bow and arrows flying through the air colliding into the targets. With only 4 hours 27 minutes from the time development started the first playable was shared and a 15 minute lunch break required to stop the rumbling stomach. Immediately after lunch randomized target positions was added to make it feel more like a game, next a limited amount of ammo, and the number of targets hit were tracked. The final addition of a quick results screen and Precise shot was game complete, 16 hours 59 minutes after the compo began with just over 6 hours of active development, not including design. The background was bland. Dark gray. With the gameplay complete effort was redirected into making it a better experience. It took 29 minutes to create the first, possibly even the final, version of the background image with the hills and trees. The bow image was actually pretty good as is, but the arrow needed to pop more, so time was spent on the arrow. The target needed new art completely. The initial design of the game had a huge feature that would be extremely tough to pull off, especially within the 48 hour deadline. The feature would be amazing and an idea occurred that took exactly 15 minutes to implement, test, see the failure and remove. Unfortunately it just didn’t work quite that well. 21 hours 5 minutes after the competition started and the first sound effects were being created. The arrow hitting the target and first attempt at the bow string firing an arrow. By the halfway point basic sounds and the final music were implemented, it was time for a dinner break. The second day doesn’t have as many landmarks to go by. RescueTime still has a record of every minute, but it just doesn’t know what features were completed and when, so the timeline gets a bit fuzzy. The entire day was spent to polish and make a better experience for the player. During lunch it was designed to have pre-determined, playable levels instead of the randomness that was used for playability testing. The concept of levels actually proved more difficult and much more time consuming than expected, a small intro sequence was required to determine the level, arrow count, number of targets and timing of the level, also needed to design levels and get the game to progress through them. This was an easy task but a much more time consuming than estimated. This took slightly more than 5 hours of implementing and the levels were just tossed together for testing the progression, not actually designed for final levels. The feedback from that playable beta came back and 45 hours 33 minutes after the compo began it was clear that the game was no longer fun. With only 2 hours 27 minutes remaining the decision was made to cut the levels, a feature that ate 10% of the total time available, cut. Gone. All in the name for fun. Back to randomized targets and the remaining time was spent on the unfinished results screen. Sounds effects, a background scroll, timed scoring and tallying up the score as well as the reward stars were finished just on time, with the final build being made just 5 minutes before the end of the competition. The scope of Precise Shot was perfect. 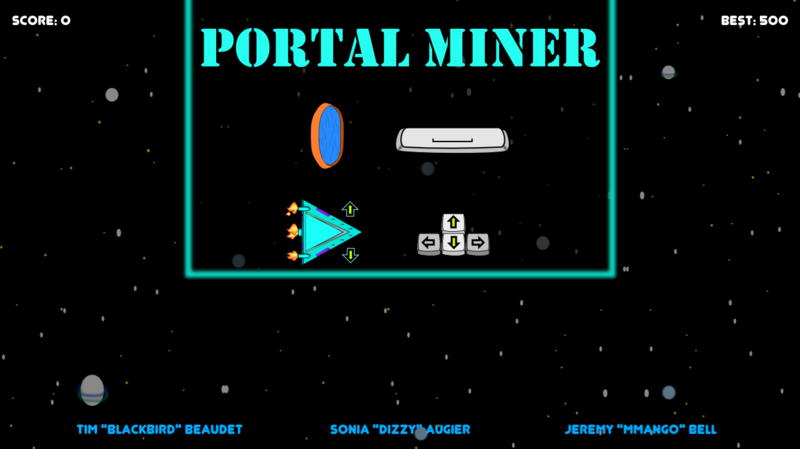 Having the game complete after only 6 hours of development was critical to success. A single, simple, playable feature that could be tuned and perfected and polished for fun. This will be something to aim for in future jams. The fun was proven, and it doesn’t come naturally. 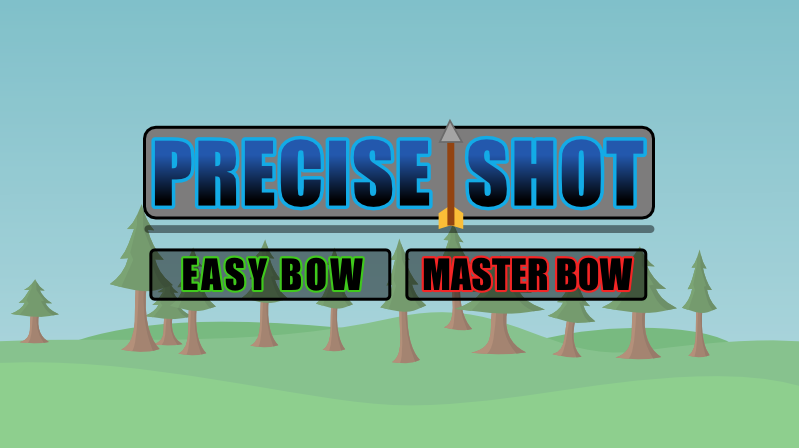 The bow controls and arrow forces were tuned for at least 30 minutes, and honestly may have needed a bit more time, but the design of Precise Shot was exciting and developing it was fun, as was the 2 hours 54 minutes of play testing. Cutting features as needed. A lot of time was dedicated to level based design with moving and rotating targets that got cut in the final hours. This was a hard decision to make given the amount of effort, but it is clear this made Precise Shot more fun than it would have been otherwise. Estimating time when planning the features and areas to polish during the last 8 hours, moving and rotating targets and level progression were grossly underestimated, and didn’t end up in the final version. Feature creep happens on every project, a 48 hour project is no exception, but several of these features cost time that was not initially planned for, like when the Master Bow ‘difficulty’ was re-added as a separate mode. Although cut, level progression, and moving/rotating targets fall into the feature creep also. Player feedback was more confusing than expected, the first attempt at controlling the bow was unintuitive, most players didn’t understand the scaling power level or dropping/releasing of the arrows. For next time the design of a feature will need to take feedback into consideration a bit more. It is pretty late into the month already. I failed to make a single game since I’ve joined @OneGameAMonth in September, I should have two by this point in time! So November is going to be different. Initially I was going to jump into NaNoWriMo and do some creative writing, but game development is important to me, and I need to work out those muscles. With that, I’ve announced that I will complete a game during November. I had a short discussion on twitter about this, that initially I’ve had issues with “just creating a game”. I basically set the bar of standards too high for myself. It was set at an achievable level, however I’d become overwhelmed and give up before putting any effort in, so I have now lowered the bar. In November, my game is going to be a top-down racing game. I have set the following as a minimum feature set to consider the project a success. Minimum of a single track and single car for the player. “Hot lapping” for the best lap time, with saved best lap time. Lap Validation, no wheels off, and completed a full lap. This is certainly a short list, but is a fair amount of stuff to get done, considering the time I’ve set a side and effort in the past months. I hope to build this so that for future @OneGameAMonth’s I can perhaps create additional game modes, and/or add significant features. If not obvious, racing is amazing. Two months later, zero games! Ouch. That hurt. I’ve joined @OneGameAMonth two months ago and I have zero games. Actually, upon making the announcement I failed to put any more time or energy into it. I’m rebooting though, and hoping to make something count for November. I’d really like to get TurtleBrains working a bit better before LudumDare 31, coming this December 5th-8th! Part of my issue is making the commitment, and even those small games take time to polish. I don’t want to just throw out some game and call it “my finished game this month”, I want to finish games that pop. I am after-all a professional game developer, how hard can it be to make a game in a month? But in November I will work on TurtleBrains as little as possible, mostly just enough to get better sprite handling and possibly sounds, but my focus will be on a game. Yet to be decided. I should have something started this weekend. It is time to start working out a bit. I’m not talking about going to the gym and pumping iron, or waking early to go for a jog, although those are not bad ideas. I’m talking about game development. I’ve been participating in LudumDare events for several years now, and recently LD30 took place so making a game was on the list of things to do. The weekend was quite a failure for me, the theme had beat me and left me to dry. After the theme was announced, no game ideas came. It was a struggle to find something that might become fun. I tried three different ideas from a runner, to an action shooter, to a twist on snake. At approximately halfway through the weekend the result was a version of snake with place-holder art and was not actually fun to play. I abandoned the project and went on a downward spiral, after 15 years of making games this was all I was able to come up with? It felt awful. When you fall down, get back up. It would be easy to stay down, but it is time to get better. Practice. Work on the game development skills that I’ve dried up upon. I feel good about my programming skills, but I certainly lack some subtleties that are extremely important for game development. I’d like to be able to make a game in 48 hours and have it be something that comes out looking reasonable and playing reasonably well. So I’ve joined the #OneGameAMonth community in hopes to create a basic game every month, and look forward to both the challenge and the learning experiences that will come. I will be building upon my #TurtleBrains framework that is aimed to be a high-quality C++ framework for 2D game development and real-time applications. #OneGameAMonth will also allow me to work on my artistic skills which currently stand far below that of the average five year-old. Having joined #OneGameAMonth it is time to get a jump start. 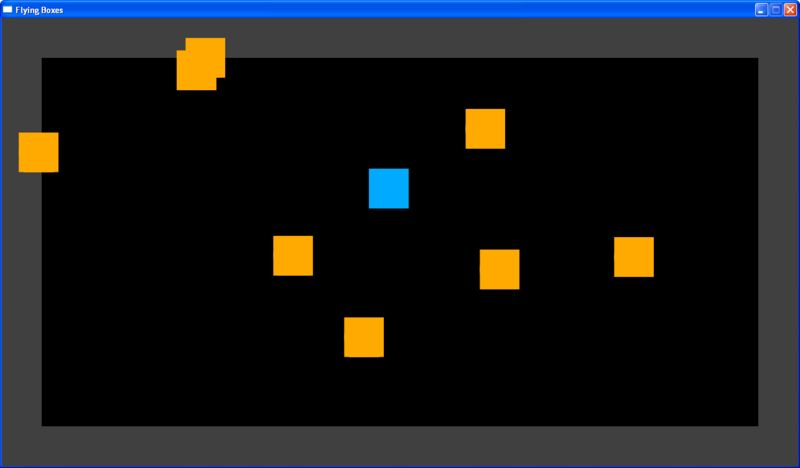 This weekend I will be working on my failed LudumDare in an attempt to make a playable, and possibly fun version of Snake. My focus will not be on design, or programming complexity, my focus will be on the art, and polish. 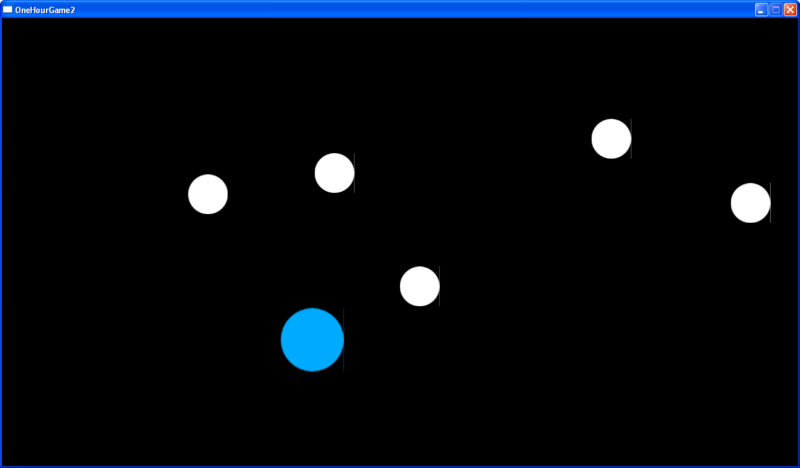 Snake is an extremely simple game that I’ve used for prototyping and framework testing before, so polishing it should be a good first exercise. Icarus Crisis is a game made for the Ludum Dare game jam, this entry had a maximum of 72 hours to complete, but was done by a solo developer, rojo. Icarus Crisis is a complex turn based strategy game, which reminds me of a playing on a table top against the game rules. The primary mechanic is the chance of dice, but each dice has different chances, and your crew members can gather more dice by exploring around the world. After each member gets a turn, the gate opens even wider, providing suspense and rushes the strategy to prevent useless moving while still collecting dice. Be careful of exploring and finding the possible ambush from the formless! I had a little free time this evening after work, and since the Ludum Dare game jam just finished this weekend I decided to give back a little since my LD30 was a pretty big failure. On the #ludumdare irc channel, I asked for a game to review, I can’t actually rate the games, but hopefully this will be better than any ratings received, I know I always appreciate the feedback and comments more than the ratings themselves. You are currently browsing the archives for the LudumDare category.